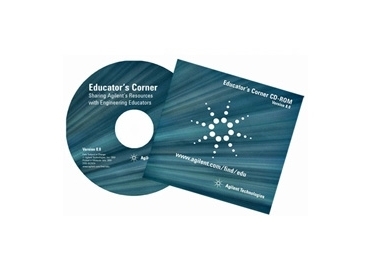 Agilent Technologies have announced the availability of Version 8.0 of its Educator's Corner CD-ROM. The CD's pre-written lab exercises are appropriate for undergraduate engineering students. All of the experiments have been submitted by leading engineering educators from around the world. The experiments are organized by academic discipline, such as applied math, communications and signal processing, and products, such as function and arbitrary waveform generators, oscilloscopes and digital multimeters. "Educators are squeezed for time and developing new lab exercises from scratch seldom makes it to the top of their priority list," said Vincent Loke, education program manager for Agilent Technologies. "We've put together a time-saving solution of pre-written labs with java animations, which we believe will enrich the student's learning experience." Agilent's Educator's Corner is a one-stop education resource for college and university engineering educators, researchers and students. Educators can access a full range of integrated teaching tools and reference materials to help them get the most out of their equipment and plan their curriculum efficiently. Tutorials and career tips are also available for engineering students.